If I was a research professor, I'd like to find out the correlation between relationship breakups and girls who suffer from menstrual cramps and backaches, or the association between a girl who suffers from regular menstrual discomfort and her career. I mean, you can't really go on dates if you just wish to lie down the whole day and not do anything when it hurts too much! One might feel even worse if your team thinks you are 'chao-kenging' (singlish for malingering). 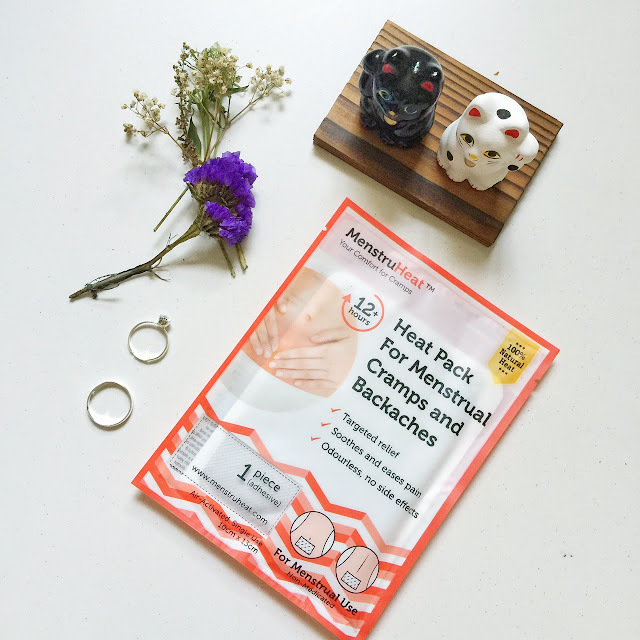 Here's my review of MenstruHeat after trying it for the past two months! Read on to find out how you can stand a chance to win a MenstruHeat Heat Pack! When Jia Jun from PSLove contacted me to try the MenstruHeat, I was exhilarated to find out that there is finally potential relief. Conversations with my girlfriends led me to conclude that each lady has a different PMS (pre-, during and post-, though the latter doesn't occur often) symptoms. For example, Miss J would usually have abdomen cramps and there was an incident where it hurt so much, that she squatted in the train and someone gave up their seat for her. As for myself, I suffer from lower backache which would only be relieved when I lie down on the bed. It doesn't make a difference whether I sit or stand, my back bloody hurts *no pun intended*! 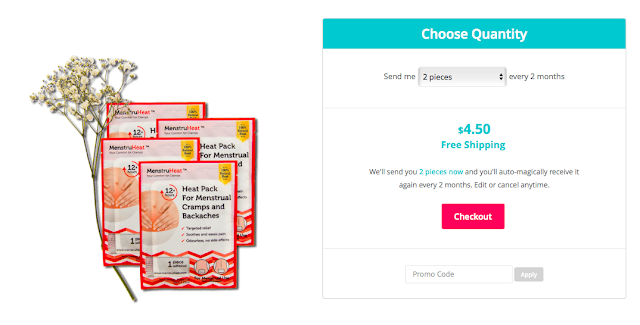 MenstruHeat provides instant, long-lasting and constant heat to the affected area so that you get natural relief for up to 12 hours WITHOUT medication. Simply open the packaging and MenstruHeat will start to heat up. When I took the product out, I immediately thought of the Japanese heat packs that I used in Japan and the foot detox pads that I sometimes use! Anyway, you just have to peel the sticker off and paste it to the area of affliction. There are three ways of pasting it. 1. Directly onto the skin — most effective if you're feeling extreme discomfort and pain. You can watch this detailed tutorial video for further information! 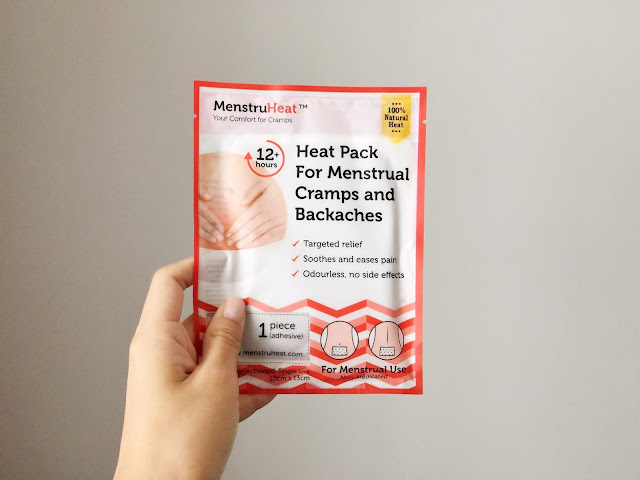 If you SUFFER from menstrual cramps and backaches, there are other relief methods besides medication like Menstruheat! In the first hour of my 12-hour final-year project meeting, I started to experience really awful backache and it was difficult to focus. I got instant relief (probably after about 30 minutes later) after pasting the heat pack directly to my skin. It was around late evening when my friend Miss J started experiencing abdominal cramp. I told her about MenstruHeat and since I only had one sheet with me, I asked if she was okay to share. They were pretty surprised as the heat pack is not visible under my shirt, so it's a great relief that I could conceal it! She initially placed it above her shirt but thought that it wasn't effective, and I told her to place it directly on her skin. She didn't feel any discomfort after that! Anyway I'm really glad that I didn't have to take any medication (you know, the pink pill). Provides relief from abdomen discomfort and menstrual cramps for up to 12 hours. Air-activated pack does not require additional heating or shaking. Suitable for backaches and muscle aches. 2. Purchase it online where you can select any amount from 2 to 10 pieces. They will ship it to you every two months. 1. Like Littletinysun's and PS.Love 's Facebook page. 2. Tag three friends on the Facebook post. 3. Comment on Facebook: What did littletinysun use the heat pack for? Contest ends 15 May 2016. MenstruHeat : Enjoy 50% OFF when you subscribe to their Facebook. Valid till 3 May, 2016.